This painting was brought to our studio after having sustained fire damage. 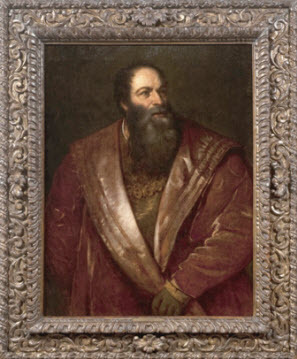 The work is an early, well executed copy, circa mid 19th century, after Titian’s “A Portrait of Aretino”. The original is housed in Palazzo Pitti, Florence. Pietro Aretino was a well known playwright, poet and satiric, who had significant influence on contemporary art and politics in Europe in the 1500s. 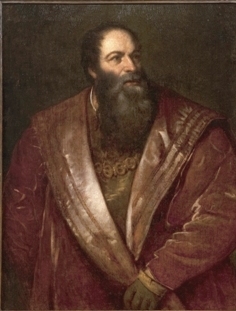 Because of this influence, he became a close friend to Titian. The painting and frame were subjected to numerous and varied types of stress during the fire. While the painting and its frame were not directly burned, they were exposed to heat and smoke, both of which left considerable damage. Upon examination it was quite obvious to the trained eye that this painting had been previously repaired at least once. It underwent a heavy restoration approach in which rather than using an inpainting technique to compensate for losses and disfigurements, a “toned” varnish (varnish mixed with pigment) was applied as a final coating to disguise numerous, old abrasions. When a layer of soot was removed it became clear that the varnish layer had been affected as well. We then faced a problem: if we removed the varnish, all abrasions would be exposed and the hereto unknown condition of the dark background would be revealed. Secondly, the old repaint should be removed as well. This would require complicated and invasive treatment process, which we felt it best to avoid. A tenet in the field of professional conservation is to employ a non-invasive approach when possible. The painting appeared slightly darkened because the pigmented varnish had discolored over time. So, taking into consideration the conditions described, we decided to thin down the layer of toned varnish as much and as evenly as possible. The second step was to stabilize the paint layer in several areas, as it was delaminating from both the gesso and the canvas. In the past, the painting had been lined to a lining canvas using natural glue, therefore it was appropriate to use the same material to consolidate the lifting paint layer. Natural glue was warmed and then brushed over the damaged areas. Next, a layer of Asian tissue was placed on the painting’s surface to protect it while a warm tacking iron was gently glided over the wet surface. This technique caused the old glue to regenerate and the paint layer to relax. Using a Teflon tool, gentle pressure was applied to soften and flatten the paint layer back onto the gesso. The surface was then dried with the same tacking iron through additional layers of tissue paper. When the area dried, soft weights were placed on the painting for three days. After the paint layer had been flattened and stabilized, the Asian tissue was removed using warm water and cotton swabs. Stabilized dammar, or varnish resin, was chosen as a protective isolation layer coating because it is appropriate to the period of the painting. The stabilized dammar saturated the paint layer, lending depth and brilliance to the painting. Inpainting was then carried out in the areas of paint loss and abrasions; this helped to adjust the tonality of the old repaint. Finally, a very light dammar spray coating was applied to unify the surface. The treatment result was very successful and gratifying as well. Being of carved wood and gilt, this period Mannerist frame compliments the painting perfectly. The historic deterioration and recent stress caused by the structure fire, created a complicated set of problems. Over a long period of time, the wooden structure had dried and shrunk beneath the gilt decoration. Gilding is executed on a ground layer called gesso, which is built up in layers at least the thickness of an egg shell. Unlike wood, gesso does not shrink over time, so, as the wood dried and compressed, a gap grew between the wood and the gesso. Any pressure placed on the gesso would cause it to crack much like an eggshell, in turn causing detachment and loss. Only adding further complications, a wood boring insect infestation from some time in the past had left even larger voids and losses below the gilt decoration. Wood boring insects do not like to eat gesso, so they will eat the wood below it leaving an invisible void. On top of these pre-existing problems, the heat and moisture from the fire began to weaken the binder that holds the gesso together, causing it to crumble and disintegrate. Only a thin layer of varnish, likely applied during the last restoration of the painting, was holding the gesso together. On top of all those layers, there was a layer of soot. The goal was to save as much of the original gilding as possible, to remove as much disfiguring soot as possible, and to fill large voids left by the insect infestation. Due to the extreme fragile nature of the gesso, it was not possible to clean the surface first. Testing revealed that the best approach was a complete re-saturation of the gesso to replace the degraded binder. A slow a careful application of consolidant to localized areas allowed saturation without washing away the fragile crumbling gesso. As the consolidant began to set and harden, the surface was gently pressured down to the level of the wood, encouraging re-adhesion, eliminating the gap. This approach required focusing on small controlled areas and could not be rapidly accomplished. After the gesso had been stabilized and secured to the wood, and the historic insect voids had been filled, next came the task of reducing the disfiguring soot. Since it had been necessary to apply consolidant over the soot to saturate the gesso, the soot had also been consolidated to the surface. Earlier testing revealed that applying the same consolidant in a greatly diminished strength to the frame would soften the top most layer of consolidant in which the soot was embedded. A swab dampened with such consolidant was rolled over the surface, allowing the release of a significant amount of soot while laying down a fresh layer of consolidant. This process significantly improved the appearance of the surface. However, varnish had been applied over a layer of grime at an earlier date, and this dirt layer was still visible. It was determined, through test removal of several areas of this varnish, that removing it was not practical because it endangered the gilding and did not provide a significant aesthetic improvement. Therefore, the previous layer of varnish, as well as other historic restorations, were left in place. As may be expected, there had been many chips and losses to the gilding due to its fragile nature. It was determined that infilling and ingilding such losses were beyond the scope of this treatment for fire related damage. Additionally, there had been numerous restorations in the past, of varying quality, which were not addressed during this treatment. The aforementioned historic losses and fills to insect damages were toned to emulate the already distressed surface with a reversible in-paint. A final protective layer of reversible conservation varnish was applied to the surface of the frame. The painting was then reinstalled in the frame and documented. The work carried out on this piece served to heighten its artistic merit, and further compliment the beautiful period frame in which it had been re-housed.